The AP 6600 Snack Vending Machine is an excellent choice for a smaller location. It is a smaller version of the AP 7600. Very user friendly and easy to program. With the Automatic products 6600 Snack Machine standing in your break room the snacks are surely to fly off the shelves. . The Automatic product AP 6600 Snack machine comes with a small footprint, 33’’ in width, but has a huge capacity to be able to hold 32 different types of selections of your favorite snacks. The Automatic Products 6600 Snack machine is great for smaller locations and with a large variety and shallow shelves it makes for happy customers with less stales. We never let a vending machine go out the door until it is finished and looks and works like brand new. With the amount of years we have been in the business we know what the machine needs to work problem free. We not only sell you the machine but take care of you after the sale. 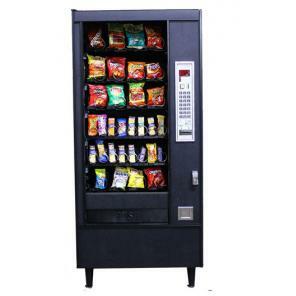 Automatic Products 6600 shallow Snack Machine – Dimensions: Height 72″, Width 33″, Depth 27 5/8. Shipping weight 680 lbs for the shallow. Automatic Products 6600 Deep Snack Machine – Dimensions Height 72″, Width 33″, Depth 35″. Shipping weight 740 lbs . 32 selections, plus 4 gum selections. Comes with 4 pastry-chip trays and 2 candy trays. Includes an rebuilt MEI – Mars Validator and changer. Includes new trim and durable polycarbonate front, side and back panels to give the machine abrand new appearance. You might also want to look at a larger machine the Automatic Products 113 Snack Machine.